A twenty-year-old marble floor in the high-traffic center of this busy home in Gladwyne, PA was in need of professional attention. The Montgomery County homeowners had four small children and a dog. As you can see in the BEFORE image, the floor was very scratched and worn. In addition, the floor had lippage, which means that some of the tiles were not level. We ground the floor level, honed the stone to remove the damaged upper layer, and polished the marble to the gorgeous, reflective shine you see in the AFTER image. It looks like you can reach down into the tile and touch the light fixture. We also applied a penetrating sealer to inhibit staining. The homeowners were very pleased with the outcome and plan to contact us again in the near future to service the other stone floors and surfaces in their home. To learn more, visit our Marble Services page and watch our video, Marble Floor Polishing. 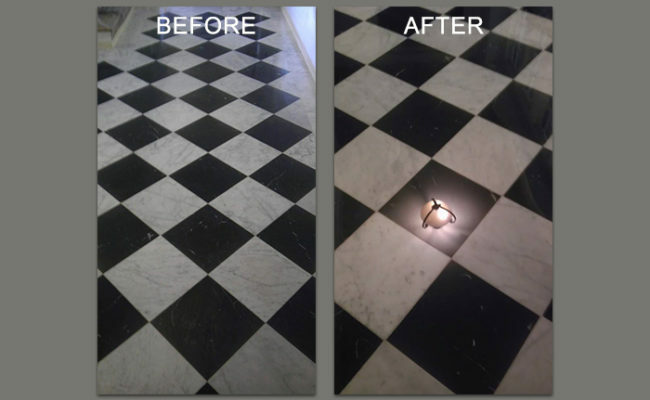 Do you need marble floor honing and polishing services in the Philadelphia or Delaware Valley area? Use our online contact form or call (610) 356-4100 today for a FREE estimate.